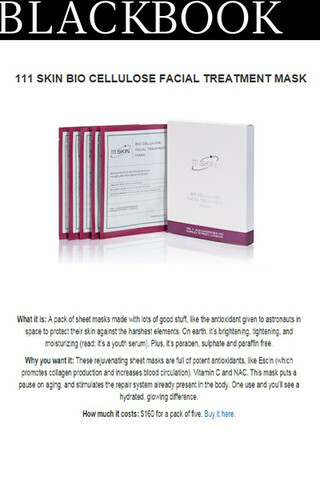 The 111SKIN Bio Cellulose Facial Treatment Masks were included in a round up of products that help you get carded. BlackBook.Com's article writes about the ways to look under 21.The mask is described as, "this mask puts a pause on aging, and stimulates the repair system already present in the body. One use and you’ll see a hydrated, glowing difference." "What it is: A pack of sheet masks made with lots of good stuff, like the antioxidant given to astronauts in space to protect their skin against the harshest elements. On earth, it’s brightening, tightening, and moisturizing (read: it’s a youth serum). Plus, it’s paraben, sulphate and paraffin free. Why you want it: These rejuvenating sheet masks are full of potent antioxidants, like Escin (which promotes collagen production and increases blood circulation), Vitamin C and NAC. This mask puts a pause on aging, and stimulates the repair system already present in the body. One use and you’ll see a hydrated, glowing difference. How much it costs: $160 for a pack of five. Buy it here."